The real unemployment problem- an increase of 17.9 million Americans no longer in the workforce since 2000; According to the U.S.Census 49% of Americans live in a home that receives direct monetary benefits from the U.S.Government. Not the kind of “Change” I like to see. 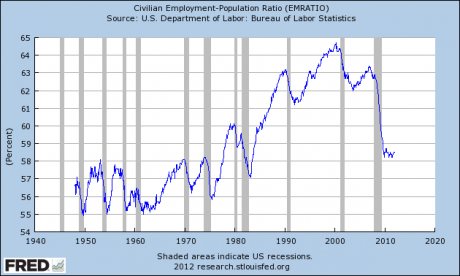 Looking back at the recessions in the 1960’s, ’70’s, and ’80’s, we see a sharp recovery in employment. No such luck with the last recession. Strawman argument from a Nobel prize winner. Isn’t that something? That’s what happens- I guess- when you look at U-3 instead of U-6 Unemployment figures. Let’s look at some less obscure points. How about the ratio of Americans not in the workforce between 2000-2011 versus the increase in population over the same period? Population increased over 30 million; folks not in the workforce increased to 17.9 million in the same period. That is probably too weak a signal for an economist of Mr. Krugman’s pay grade to acknowledge. Look at the chart above. 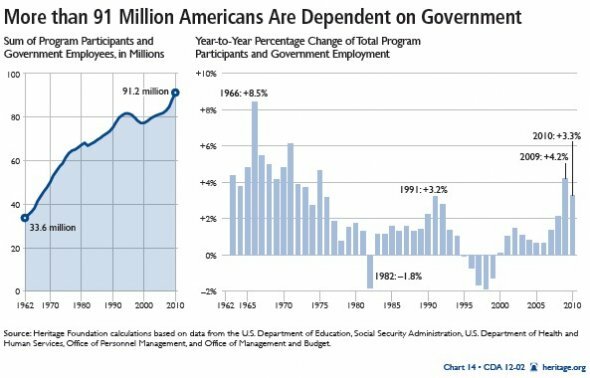 Bottom line, added to every other dependency and entitlement program, the unemployment that is “not structural’ according to Mr. Krugman actually brings the number of Americans dependent upon the federal government up to 91 million. I think that folks would rather have a job. Our shops have openings for skilled machinists. Our schools have programs to teach machining. Yet there are no applicants. Dear Mr. Krugman, we do have a ‘structural’ unemployment, problem, and it isn’t at all what you think. This entry was posted on Tuesday, May 15th, 2012 at 3:11 am and is filed under Front Office. You can follow any responses to this entry through the RSS 2.0 feed. You can leave a response, or trackback from your own site. Candidates usually come from families that are already in the business. In recent history the work experience of a family member in this economic turmoil, starting with jobs being exported to Mexico and then to China, did not present an environment that would beckon talented individuals to pursue a career in the manufacturing community. Most significantly the father’s experience in the manufacturing sector should contribute to the son or daughter considering a position in the manufacturing world. But, add to this dilemma the onus of relocation of the business done on the basis of a financial wizard’s calculations, that results in the disruption to a family’s life style may also contribute to the lack of prospects for skilled tradesman. It is a very complex problem, because at the end of the day the first and foremost objective is to produce a quality product and make a profit. If all do not share or feel they are sharing in the success of the company and feel good about their job, then don’t be surprised at the lack of candidates. The word of mouth explanation of the job will either bring you candidates or reduce the pool of available candidates..
Plus, add to this dilemma the reduction or elimination of apprenticeship programs by manufacturers, when schools can provide the basics, but if there is nothing guaranteed at the end, then this situation will also contribute to the reduction of the number of qualified candidates. In these economic times, what is the right solution? Your guess is as good as mine! Although I write from the UK, I’m in Northern Ireland, where something like 60% of jobs are (or have been) directly dependent on the UK government for some time. Our formerly strong manufacturing base withered in the 1960 to 70s as recession bit, and more recently manufacturing professionals have seen off-shoring result in further redundancies, and the type of miserable social experiences for the redundant and their families. These experiences have become ingrained in the mindsets of the communities. Even here, where few manufacturing jobs exist, many are being filled by migrant workers, mainly from eastern Europe. This is also partly due to the welfare system, but where you have areas of growth in the US, it’s not hard to see why the social experiences of those affected by previous layoffs would discourage anyone from feeling secure enough to commit to a career in manufacturing. Despite the fact that I love the fact that I work in manufacturing, where tangible value add pays my wages, I’d be reluctant to see my kids follow me. Certainly not if they want to stay in this part of the world. What a fact filled and poignant response. I am pleased to see my son take up the trade, I think that folks with skills will be in far greater demand as us baby boomers check out of the industry… Thanks for advancing the conversation. I believe the reasons there aren’t more candidates for metal working, machining and such is two fold. One there are alot of this generation that are fixated on playing video games and want to be the next millionare game designer. They don’t want to get their hands durty in manufacturing. Second as was pointed out by John, high schools these days are eliminating the machine shop classes due to budget constraints and lack of enrollment. I was lucky enough to have that training available to me when going to high school. Upon graduating went on into the family business being third generation. My grandfather was a tool and die maker as was my father before me. As far as unemployment is concerned the number is actually higher just people have stopped looking. Someone once said that the only thing keping us form being in a so called depression is the social programs of the government. If unemployment wasn’t being propped up with extensions in the weeks of unemployment compensation, we would be worse off. But then again maybe we really are and just don’t know it. I think there is a cultural aspect to the dire shortage of machinists in particular. Once a dirty job with metal chips and lube oil getting all over everthing, including the machinist, this profession now way cleaner and requires computer skills, CAD and CAM education, and pays pretty darn well. 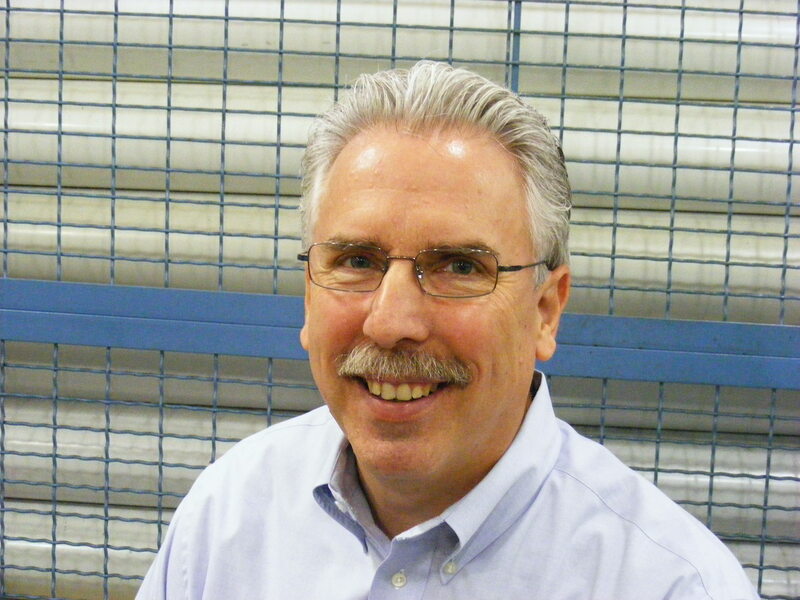 It is the heart of maintaining our manufacturing strength in the USA. We have the average skilled machinist age near 60 years. It’s a sad state of affairs. I invite folks to consider the group Reshoring North Carolina Jobs which is intended to foster discussion of this and related topics.